A recent “Tip of the Week” at Copyediting Newsletter, “Citing Work: What Do Editors Really Need to Do?” by Erin Brenner, discussed the problem of editing citations. As the article pointed out, “what you do to citations and how long that takes can greatly affect your bottom line.” Unfortunately, the article repeated and reinforced the shibboleth that editing citations is not (and perhaps cannot be) profitable. As I am sure you have already guessed, I disagree. The problem with references is that too many authors put them together in a slapdash manner, ignoring any instructions that the publisher may have given about formatting. And Ms. Brenner is right that straightening out the author’s mess can be both a nightmare and unprofitable. Let me step back for a moment. I want to remind you of what I consider a fundamental rule about profitability in editing: the Rule of Three, which I discussed 3 years ago in “The Business of Editing: The Rule of Three.” Basically, the rule is that profitability cannot be judged by a single project; profitability needs to be judged after you have done three projects for a client. Yes, I know that most freelancers look at a single project and declare profitability or unprofitability, but that doesn’t make it the correct measure. Anyway, the reason I raise this here is that it is true that for a particular project, having to edit and format citations can make a project unprofitable. But then so can editing the main text. I have edited many projects over my 31 years where I wished there were more references and less text because the text was badly written but the references were pristine. References are not the automatic key to unprofitability. Also part of the problem is not being clear what is your role as editor when it comes to the references. Copyeditors, for example, do not (should not) “fact check” references. When I have been asked to do so, I have clarified what the client really means, because I have no way of knowing if a cite actually supports the proposition to which it is attached. If the client really does mean “fact check,” which has yet to be the case, then I decline the project; I am simply not able to devote the time needed to read the cite and determine if it supports the author’s proposition and the client is not prepared to pay me to do so. AQ: (1) Please confirm that cite is correct. Unable to locate these authors with this article title on PubMed. In addition, PubMed/NLM Catalog doesn’t list a journal by this name. (2) Also, please provide the following missing information: coauthor name(s), year of publication. 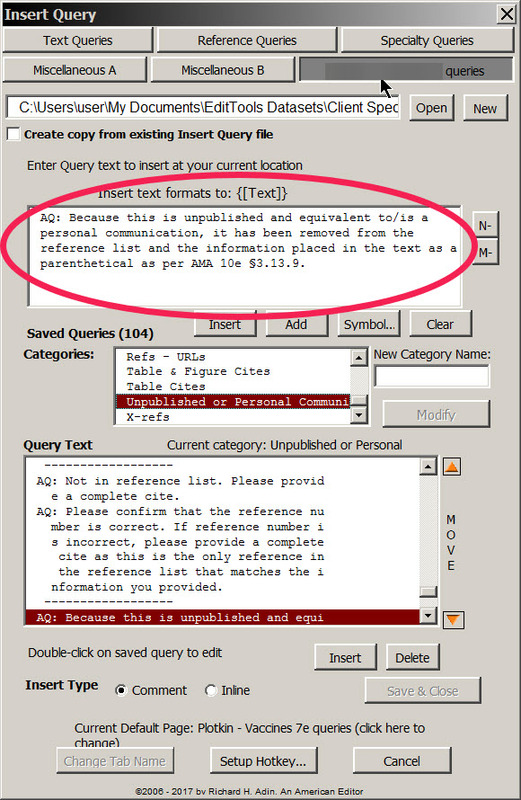 It is much quicker to select a prewritten query than to write it anew each time. Cite work can be very profitable. As with most of editing, whether it is profitable or not often comes down to using the right tool for the job at hand. 6. Jackson, S.P., W.S. Nesbitt, and E. Westein, Dynamics of platelet thrombus formation. J Thromb Haemost, 2009. 7 Suppl 1: p. 17-20. 7. Roth, G.J., Developing relationships: arterial platelet adhesion, glycoprotein Ib, and leucine-rich glycoproteins. Blood, 1991. 77(1): p. 5-19. 8. Ruggeri, Z.M., Structure and function of von Willebrand factor. Thromb Haemost, 1999. 82(2): p. 576-84. 6. Jackson SP, Nesbitt WS, Westein E: Dynamics of platelet thrombus formation. J Thromb Haemost 7 Suppl 1:17–20, 2009. 7. Roth GJ: Developing relationships: Arterial platelet adhesion, glycoprotein Ib, and leucine-rich glycoproteins. Blood 77(1):5–19, 1991. 8. Ruggeri ZM: Structure and function of von Willebrand factor. Thromb Haemost 82(2):576–584, 1999. As you can see by comparing what the authors provided and what the book style was, a lot of work needed to be done to go from the before to the after. Conforming 1,800 references the standard/usual way editors do this type of work — that is, manually, period by period — could take many hours and thus be a losing proposition — or by using the right tools for the job, it could take a few hours and be a money-making proposition. I was able to conform the references in less than 4 hours and for 3.5 of those 4 hours, I was able to do other editing work while the references were being conformed. How? By using the right tools for the job, which, in this case, was EditTools’ Wildcard Find & Replace and Journals macros, which were topics of recent essays (see “The Business of Editing: Wildcarding for Dollars” and “The Business of Editing: Journals, References, & Dollars,” respectively). To clean up the author names and the cite portion (i.e., 1991. 77(1): p. 5-19) I used EditTools’ Wildcard Find & Replace Macro. Because it lets me write and save a find-and-replace string and put multiple strings together in a single “script,” with the click of a button I was able to run several dozen macros that cleaned up those items. In addition, EditTools’ Page Number Format macro let me change partial page ranges (e.g., 110-19) to full page ranges (e.g., 110-119) automatically. It took less than 15 minutes for the full reference list to be conformed and should I face a similar task next week, I already have the necessary scripts; I just need to load and run them. What took the most time was fixing the journals. My journals dataset is currently 78,000+ entries and the Journals macro has to run through 1,827 references 78,000+ times. But what it does is fix those incorrect entries it finds in the dataset and highlights them; it also highlights (in a different color) those journal names that are correct. What that means is that I can see at a glance which cites I need to check (in this case, just a handful). And while the EditTools Journals macro is running in the background, I can continue editing other files – which means I am getting paid twice (because I charge by the page, not the hour). Do I earn money on this? Yes, I do. Consider this example (the numbers have no relevance to what I actually charge; they are an example only): If I charge $3 per manuscript page and the references constitute 230 pages, it means the cost to the client is $690 regardless of whether the references take me 1 hour or 50 hours. In this case, to conform the references took about 4 hours. For those 4 hours, I earned $172.50 an hour as an effective hourly rate. The reality, of course, is that I still had to look over the references and lookup a few, and I actually spent 7 hours on the references altogether, which means my effective hourly rate would be $98.57 at $3 per page. (Had I charged $25 an hour, I would have earned just $25 an hour, approximately one-quarter of the per-page rate earnings, which is why I prefer a per-page rate.) As you can calculate, at a different per-page rate, the earnings would have been higher or lower. And that doesn’t count what I earned while continuing to edit as the Journals macro ran in the background. My point is that using the right tools and the right resources can make a difference. I do agree that if I had to fact check each reference, I would not have made any money at a per-page rate (nor at an hourly rate because no client would pay for the time it would take to fact check 1,827 references — especially when this is only one of 130 chapters), but then I wouldn’t have done the work at such a rate (or at all). Whether a task is profitable depends on many factors. The notion that editing references cannot be profitable is no more true than is the notion that editing text is always profitable. Editing references may not be stimulating work, but with the right tools it can be profitable. The key to profitable editing, is to use the right tool for the job. In The Business of Editing: Wildcarding for Dollars, I discussed wildcard macros and how they can increase both accuracy and profitability. Profitability is, in my business, a key motivator. Sure I want to be a recognized, excellent, highly skilled editor, an editor who turns ordinary prose into extraordinary prose, but I equally want to make a good living — I want my business to be profitable. Consequently, as I have mentioned numerous times previously, I look for ways to make editing more efficient. The path to efficiency is strewn with missteps when editors think that all editing tasks can be made more efficient; they cannot. But there are tasks that scream for efficiency. 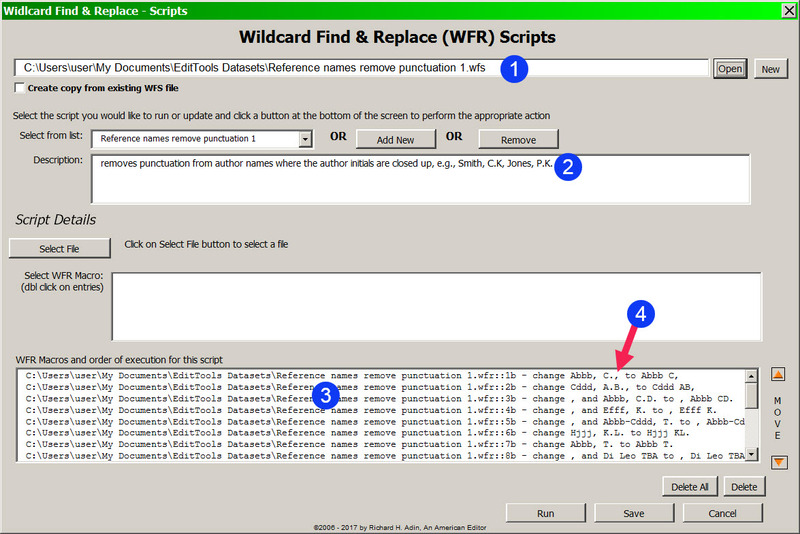 Wildcard macros are one method and work very well for the tasks for which they are suited. 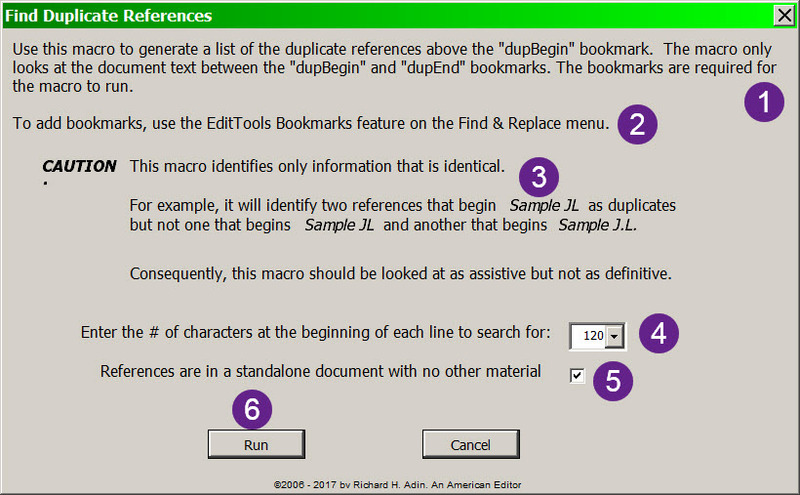 A second method, which deals with references, is the EditTools Journals macro. As I relayed in previous articles, I work on very long documents that often have thousands of references. My current project runs 137 chapters, approximately 12,000 manuscript pages, with each chapter having its own list of references, ranging in length from less than 100 to more than 600 references. And as is true of the text of the chapters, the condition of the references varies chapter by chapter. The goal, of course, is for all of the references to be similarly styled. as well as to be accurate. 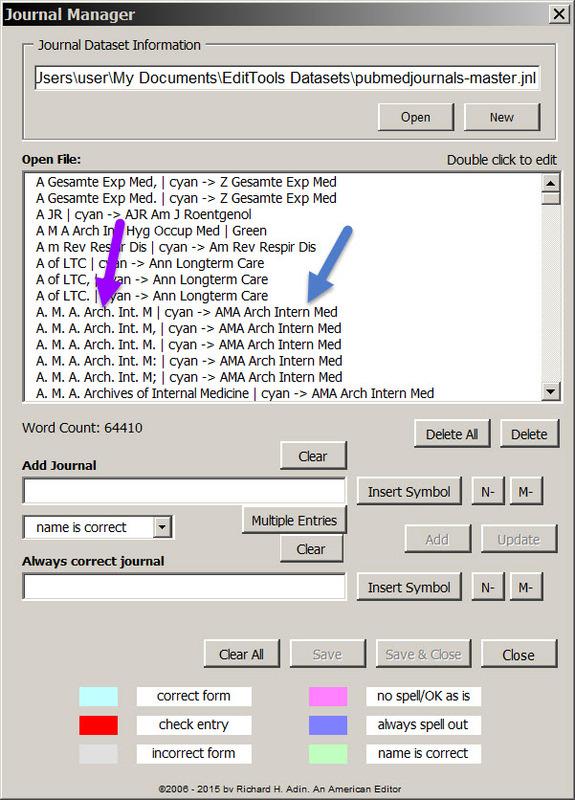 The first image shows a sample of how journal names were provided in one chapter. The second image shows how the names need to end up. The question is how do I get from before to after most efficiently? The answer is the Journals macro. The key to the Journals macro is the Journals dataset. In my case, I need journal names to conform to the PubMed style. 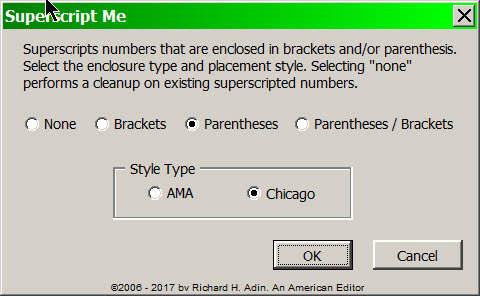 However, I could just as easily create a dataset for Chicago/MLA style (American Journal of Sociology), CSE (Cell Biochem Funct. ), APA (Journal of Oral Communication,), AAA (Current Anthropology), or any other style. The image below shows the Journals Manager with my PubMed dataset open. 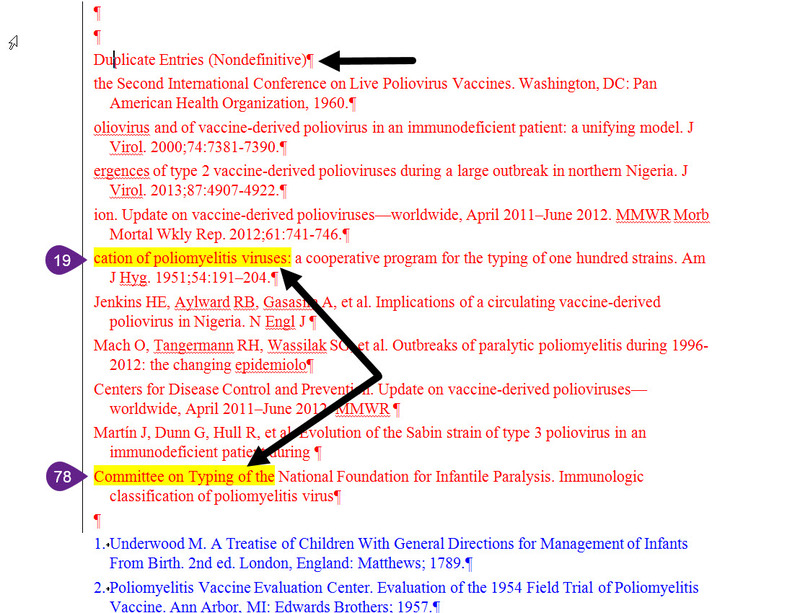 The purple arrow shows a journal name as provided by an author; the blue arrow shows the correct PubMed name of the journal, that is, to what the macro will change the wrong form. The next image shows a sample APA-style dataset. 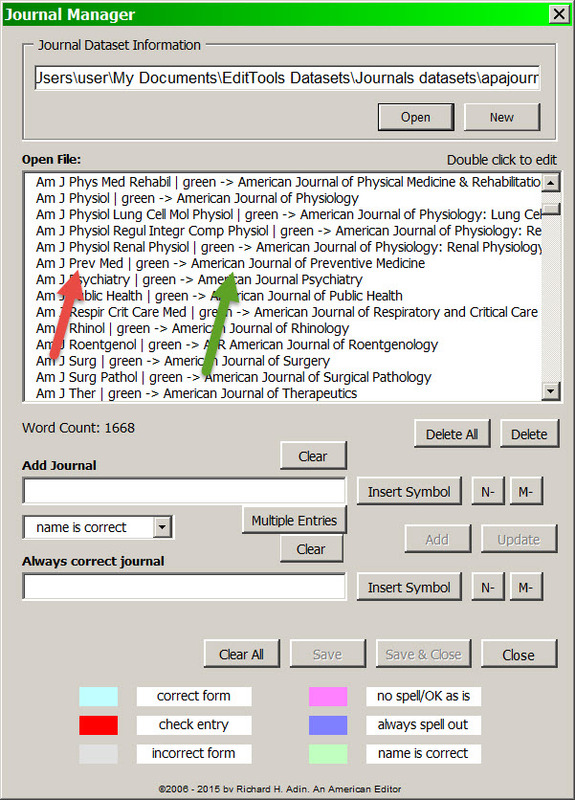 The red arrow shows the abbreviated version of the journal name and the green arrow shows the full name to which it will be converted by the macro. As I stated, nearly all my work requires PubMed styling so my PubMed dataset is by far the largest. If you look at the PubMed dataset image above, you will see that as of this writing, the dataset contains more than 64,000 journal name variations. “Variations” is the keyword. Authors give journal names in all kinds of style, so to cover the possibilities, a single journal may have two dozen entries in the dataset. With the Multiple Entry dialog open, you enter a variation in the #1 field. By default, all of the trailing punctuation is selected (#2), but you could choose among them by deselecting the ones you didn’t want. For example, if the style you work in requires that a journal name be followed by a comma, you might want to deselect the comma here because this is the list of “wrong” styles and having a trailing comma would not be “wrong.” Clicking Add (#3) adds whatever you have typed in #1 to the main screen (#4) along with the selected trailing punctuation. 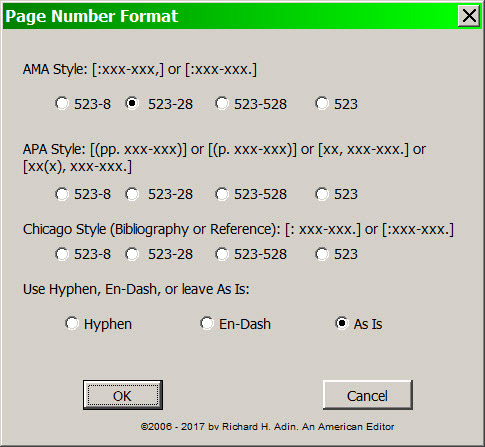 In the example, I entered N Engl J Med once in #1, left the default selection in #2, clicked Add (#3), and had five variations added to the main field (#4) — I did not have to type N Engl J Med five times, just the once. 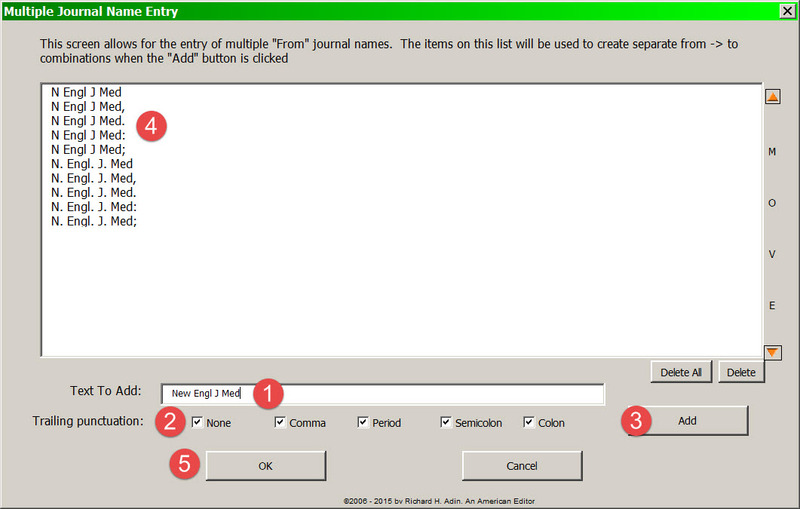 The main Manager screen — after using the multiple entry dialog — shows in faint lettering “Use ‘Multiple Entries’ button to adjust” in the Add Journal field (#1). This means two things: First, it tells you that there are journal variations waiting to be added to the dataset, and second, that if you want to modify the list of waiting names, either by adding or deleting, click the Multiple Entries button to bring the dialog back up for editing. If you are ready to add to the dataset, the next step is to tell the macro to what the “wrong” versions should be corrected. 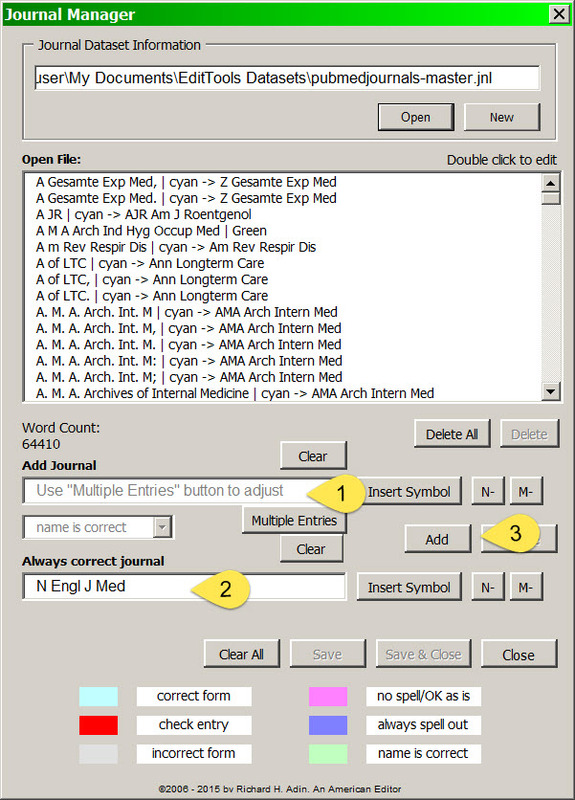 This is done by typing the correct form in the Always correct journal field (#2). If your style was to add a comma after the correct form, you could enter the correct name trailed by a comma here. In the example I show, you would just add the comma after Med. But that might not be the best way to do it because you then lose the ability to use the dataset for a style that is identical but that doesn’t use the comma. There is an alternative, which we will get to. What is necessary, however, is that the correct form be entered here so the macro knows what to do. 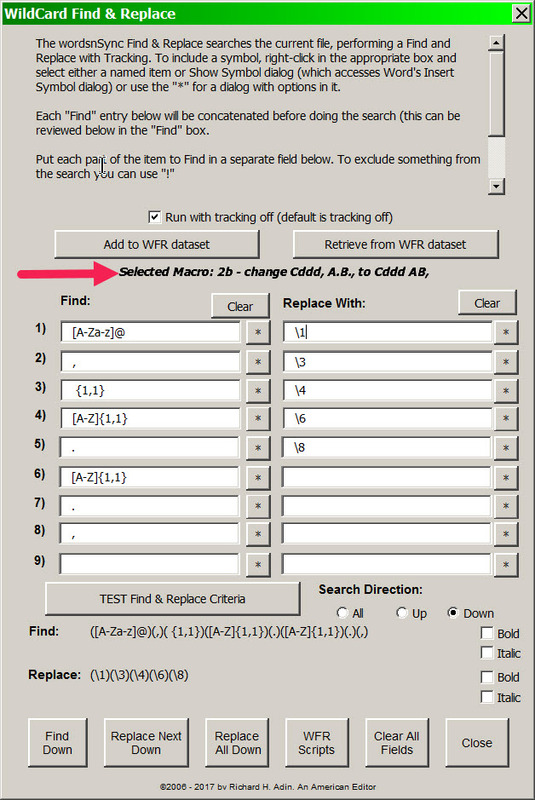 After entering the correct form (#2), click Add (#3) to add all of the variations and the correct form to the dataset. Once you have your dataset, you are ready to unleash the Journals macro. It is always a good idea to put the reference list in a separate file before running the macro, but that can’t always be done. Separating the references into their own file helps speed the macro. 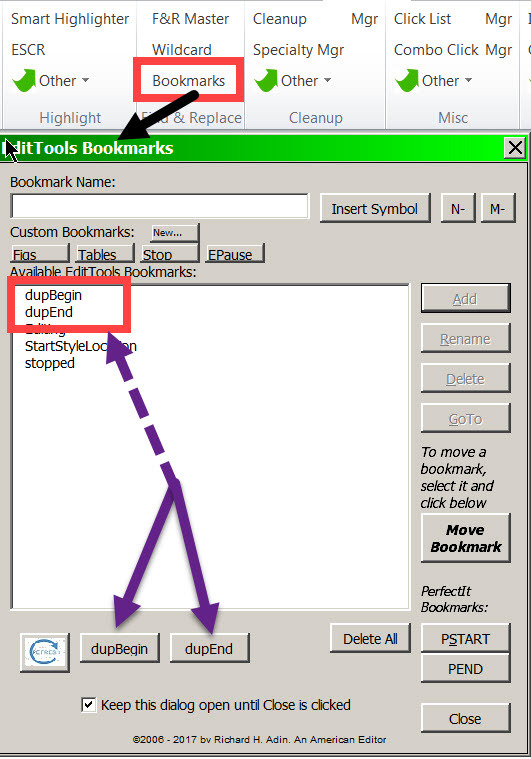 When ready to run the macro, click Journals (red arrow below) on the EditTools Tab. 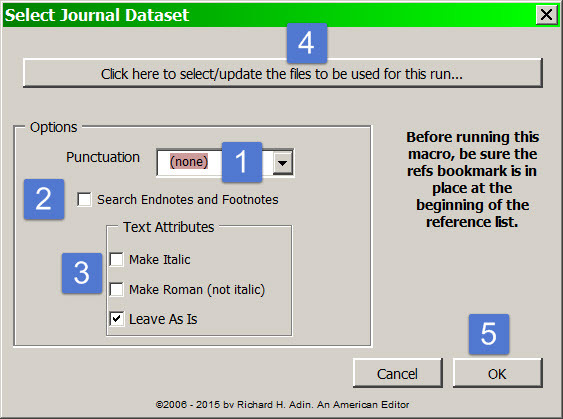 Here is the best place to select trailing punctuation you want added to the correct journal name. Clicking on the dropdown (#1) will give you the choice of comma, period, semicolon, colon, or the default “none.” If you choose, for example, semicolon, every time a journal name is corrected, it will be followed by a semicolon. Note, however, that if the journal name is correct already except that it doesn’t have the trailing punctuation, the punctuation will not be added. In other words, New Engl J Med will be corrected to N Engl J Med; but N Engl J Med will be left as it is. In this instance, using the other system (adding the punctuation to the correct name in the dataset) will work better. 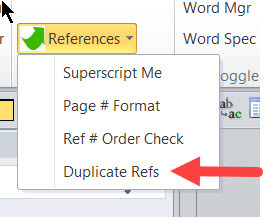 If your manuscript has endnotes or footnotes with references, clicking #2 will instruct the macro to search those items as well. You can also tell the macro to make the journal names italic, nonitalic, or as they currently are. In this instance, the macro will only change those journal names it highlights. For example, if it doesn’t change/highlight N Engl J Med because it is not in the dataset, it will not change the text attribute of it either. Clicking #4 lets you change the dataset file to be used by the macro and #5 starts the macro running. The results of running of the Journals macro depends on your dataset. Clearly, the larger your dataset (i.e., the more journals and variations it contains), the greater impact the macro will have on your reference list. The following image shows the results of running the Journals macro. Journals macro makes use of track changes and color highlighting. 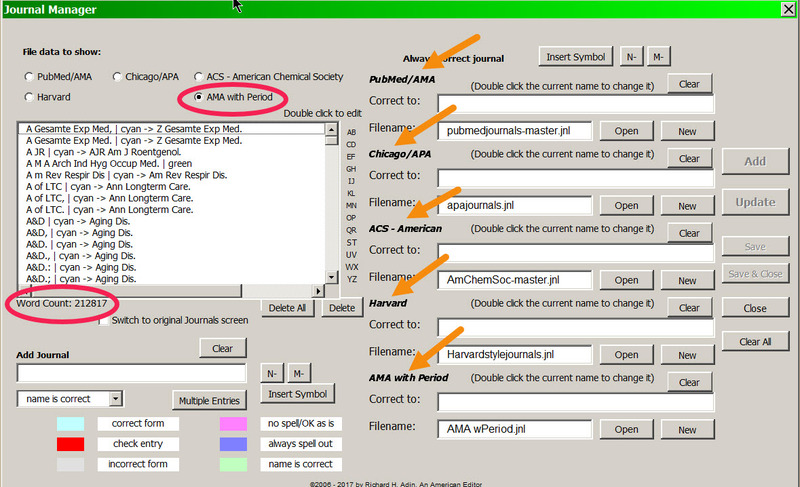 As the first instance (#1) shows, the incorrect journal name, Am. J. Kidney Dis. Off. J. Natl. Kidney Found., was corrected to Am J Kidney Dis and highlighted in cyan. The cyan tells me that the name is now correct. Note that the change was made with tracking on, which gives me the opportunity to reject the change. 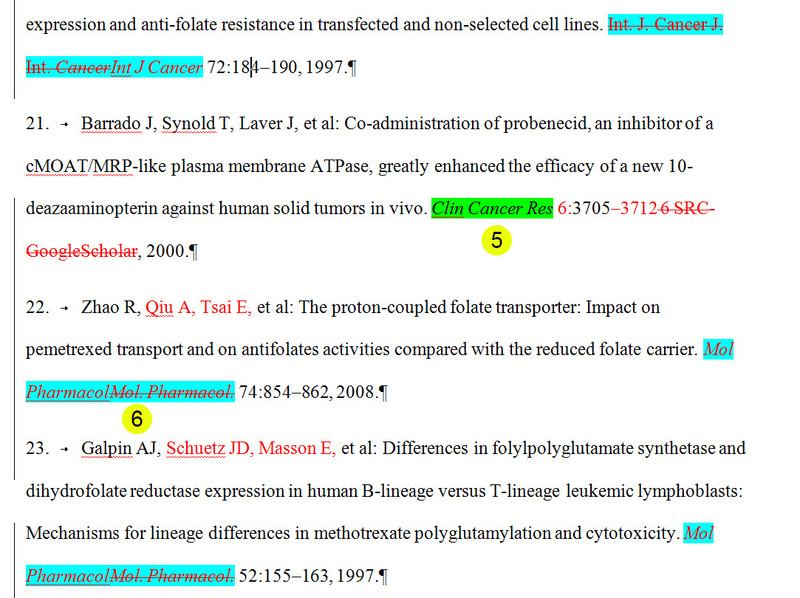 The green highlight (#2) tells me that the journal name Pharmacotherapy was correct as originally provided. And #3 tells me that this journal name variation is not found in my dataset. At this juncture, I would look up the journal in PubMed Journals, open the Journal Manager, and add the variation other needed variations of the name to the dataset so that next time it will be found and corrected. I know this seems like a lot of work, and it is when you are starting out to build the dataset. But as your dataset grows, so do your profits. Consider this: If the reference list you need to check is 100 entries, how long does it take you to check each one manually? I recently checked a reference list of 435 entries. 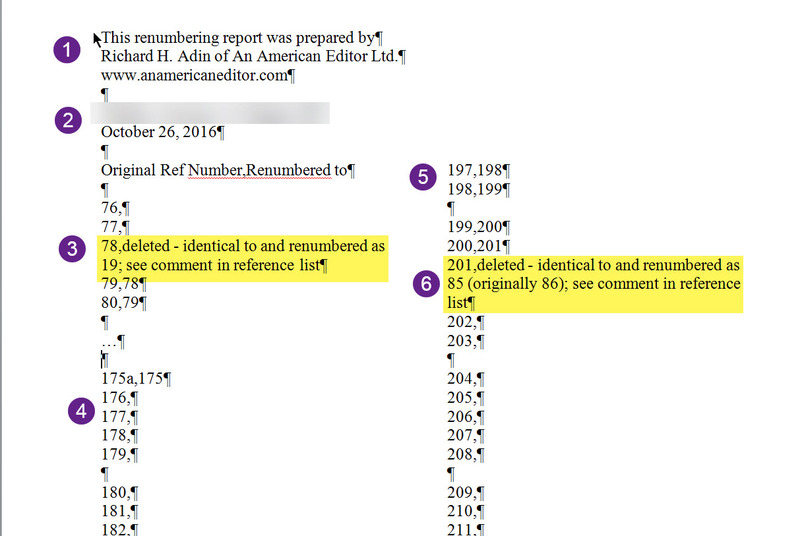 The author names were done incorrectly (see The Business of Editing: Wildcarding for Dollars for examples) and the year-volume-pages portion of the references were also in incorrect order. Most — not all — of those errors I was able to correct in less than 10 minutes using wildcarding. That left the journal names. Nearly every journal name was incorrectly done. With my large dataset (over 64,000 variations), it took the Journals macro 32 minutes to correct the journal names. (Nine entries were not journals and so were not in the dataset and seven incorrect journal names were not in the dataset and had to be added afterward.) I still had to go through each entry in the reference list, but to complete a review of the reference list and make any additional corrections that were needed took me an additional 2 hours and 10 minutes. In other words, I was able to completely edit a 435-entry reference list, fixing all of the formatting problems and incorrect journal names, in less than 3 hours. How quickly could you have done the same? Combining macros is a key to efficiency. Recognizing that a problem has a macro solution and then knowing how to impose that solution can be the difference between profit and no profit. Using macros wisely can add fun and profit to the profession of editing.